When we grow vegetables as annuals, it’s easy to forget what their true life cycle is. Take the carrot. 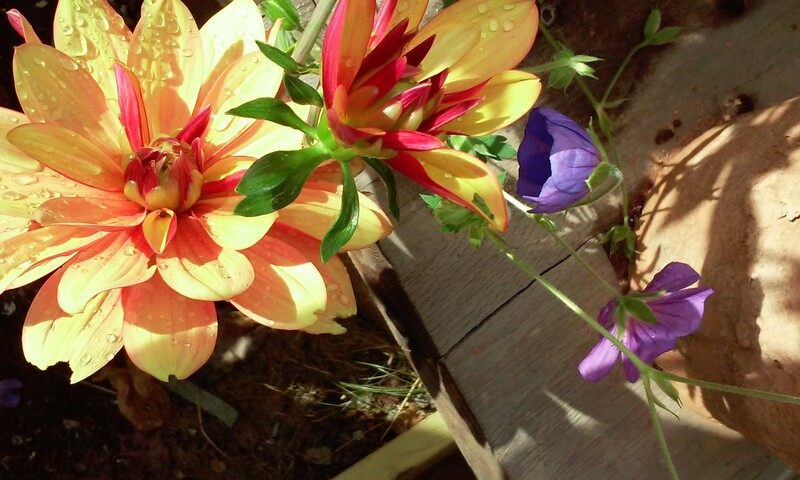 It is a biennial plant; in the wild its life cycle is over two years. The first year it grows a fantastic tap root and this is what we usually harvest. But if left to its own devices, it will use this root as a food source to over winter and, in year two, it will continue to grow, produce flowers and set seed. 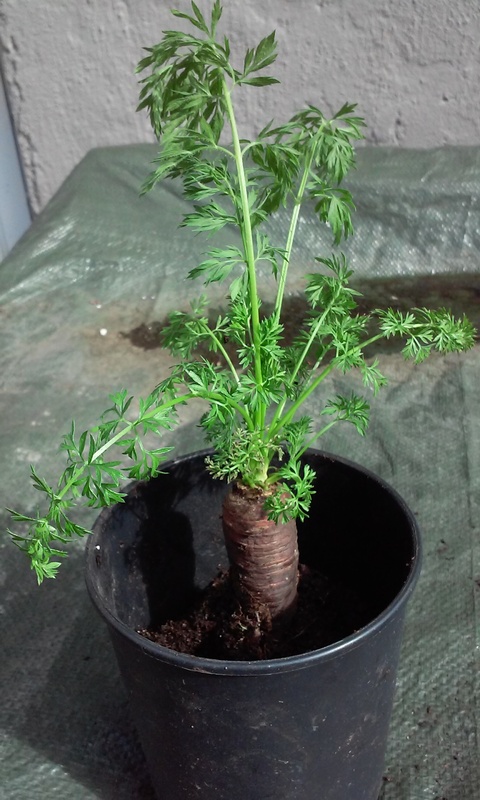 I grew this carrot from seed last year, and it was harvested in the autumn. I trimmed back its green top and stored it away in my fridge with the intention of eating it at some point. Just in a plastic bag, nothing fancy. But then I forgot all about it. Not one for regular meticulous fridge cleaning, it had got hidden by other items piled on top of it. In a mad bout of spring cleaning, I rediscovered it and, to my surprise, noticed that there was a tiny bright green shoot emerging from its top! I put it in an empty pot to see what would happen. The shoot grew bigger. So I tossed in a handful of soil left over from some sowing I’d been doing, and fed it some water. More shoots grew and got bigger, developing into some fine feathery leaves. Eventually I re-potted it and had to prise away a mass of young roots that had formed and attached themselves to the pot itself. Such was its incredible rate of growth in just a few weeks. So, the carrot is currently in my cold frame. I have high hopes of seeing some lovely carrot flowers this summer. Perhaps I’ll even try saving some seeds. Then I will have seen it through its complete and wonderful life cycle. Categories: Gardening in Oslo | Tags: biennial, carrot, overwintering | Permalink. When I came to replant my dahlia tubers it became apparent that, unfortunately, they hadn’t survived the winter. They looked fine from the outside but were hollow and dry to the touch. I had, sort of, forgotten about them, stored in a shed, wrapped only in some newspapers. Unsurprisingly they hadn’t endured the freezing temperatures. They’re made for the southern hemisphere, not for the arctic! So lesson learned…the hard way. Next time I’ll be more careful. I’ll overwinter them by finding somewhere to store them that is cool, dry, dark and, crucially, frost free. I’m tempted not to buy some new tubers now but instead see what the end of season sales throw up. In the meantime, I’ll continue my quest to grow lots of annual flowers this year such as Zinnia, Cosmos and Antirrhinum, Hopefully that will create a riot of colour and help me forget my little faux pas. Categories: Gardening in Oslo | Tags: Dahlias, overwintering | Permalink.